The operation is performed almost exclusively laparoscopically. There are several variations in port placement and number, but five or six incisions are usually necessary. The band is introduced in its open form. The stomach is exposed, and a retrogastric tunnel is created from the lesser curve side of the inferior border of the hiatus to the angle of His with a Lap-Band passer tool. This tool is then articulated at the angle of His to create the tunnel. The Lap-Band is threaded into the eye of the tool, which is then dearticulated and brought back through the tunnel to the lesser curvature side. The band is partially closed and a sizing balloon introduced. The band is closed with the sizing balloon in place to ensure the band is not too tight. If the band is adequately free, then the balloon is deflated and removed. If the band is too tight, fat in this area needs to be removed to prevent postoperative obstruction. A retaining flap is then created anteriorly by plicating the stomach to itself over the band with three to four interrupted sutures. The tubing is then brought out of the abdominal wall and the port secured to the rectus sheath35 (Figure 7.1). 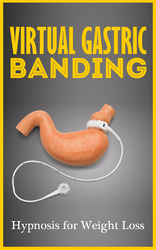 FIGURE 7.1 Gastric banding. 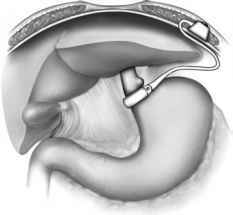 A saline-injectable locking gastric band placed around the proximal stomach. The reservoir is buried subcutaneously and sutured to the anterior rectus sheath. are the best indicators of this procedure's true potential. For longer-term data, the Australian series seems most suited for comparison. In the U.S. series by Ren and colleagues, a total of 445 patients underwent LAGB using the Lap-Band.42 There were 341 female and 103 male individuals with an average age of 42.1 years and an average BMI of 49.6 kg/m2. Average body weight was 299.4 lb. Conversion to laparotomy was necessary in one patient (0.2 percent) because of splenic bleeding. One operation was aborted due to extreme hepatomegaly in a male patient with BMI = 43, excessive bleeding, and nonvisualization of the gastroesophageal junction. Mean length of hospital stay was 1.1 days. Adverse events occurred in 10.5 percent of patients (Table 7.1). The one death occurred in a patient who experienced sudden cardiac arrest the afternoon after surgery from a presumed arrhythmia. Acute postoperative stoma obstruction was felt to be secondary to presumed gastric-wall edema or hematoma and usually responded to conservative management. Intravenous hydration was required in seven patients. Four patients (1.1 percent) required laparoscopic revision to remove perigastric fat incorporated within the band, and one patient required laparoscopic band explantation. All postoperative stoma obstructions occurred in the first 125 operations performed by one surgeon. The procedure was modified with removal of perigastric fat to minimize the amount of fat incorporated within the band, which caused external gastric compression and, subsequently, obstruction. No acute stomal obstructions occurred thereafter. There were no known cases of throm-boembolism, myocardial infarction, or intestinal sepsis. There were 13 (3 percent) reservoir port-related complications. There were five patients with port infection requiring removal of the ports. The ports were reimplanted three to six months after removal. Gastric prolapse, or band slippage, occurs when the stomach slides up through the band, displacing the band and causing obstruction. In this series, gastric prolapse was treated by repositioning or replacement of the Lap-Band. Band erosion occurred in one patient, and that band was removed. Two bands were explanted because of intraabdominal abscesses. There has been no evidence of esophageal dilatation. Four patients were lost to follow-up, and 99 of the 445 were available for one-year review. The average percent excess weight loss (EWL) at 12 months after Lap-Band surgery was 44.3 percent ± 17 (range 6.5-92 percent). 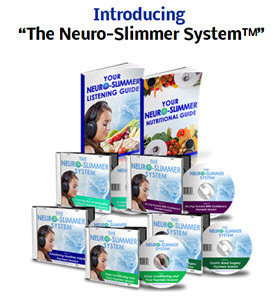 The Lap-Band is presently the safest available surgical procedure to treat morbid obesity. It seems to be, at least in the short term, as effective as other surgical alternatives.